FREE U.S. GROUND SHIPPING HERE! The Vitamix 750 Heritage Collection is an evolutionary upgrade to the highly successful Vitamix Pro 750. Like the previous Vitamix Pro 750, the Heritage Collection shares much of the same design and power. It's a 2.2 Peak horsepower motor with 5 programmed presets for Smoothies, Frozen Desserts, Hot Soup, Purée and Cleaning. It also has the legendary Variable Speed Control for precise blending. A dedicated Pulse switch is included as well as a master control On/Off switch near the rear. The 750 Heritage Collection is nothing short of beautiful. If you want to add a touch of elegance to your kitchen, the copper metal finish will certainly fit in nicely, especially if you have other copper accessories in your kitchen such as mixing bowls or utensils. Due to the metal motor base housing it is indeed heavier than the original 750. This is actually a plus because it aids in keeping the base more stable on the counter. The sound dampening was also improved. From my audible estimation it appears to be a 10% decrease in blending noise over the original 750, which also had very good sound dampening. 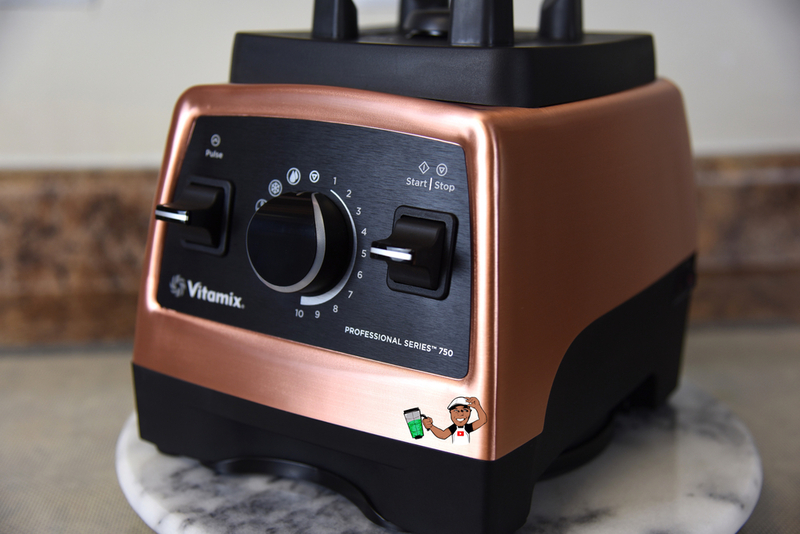 The first question generally is, "What's the difference between the original Vitamix Pro 750 and the new Pro 750 Heritage Collection?". Operationally they are the same. The Heritage Collection is definitely an upgrade however. It features an all metal motor base housing which aids in durability and helps to provide more sound dampening to reduce blending noise. The Heritage Collection also comes in two metal exteriors, Brushed Stainless Metal Finish and Copper Metal Finish. Both finishes are polished with a clear coat for a smooth finish that resists scratches. Something to note, but not a deal-breaker. Unlike the original Pro 750 with a fully illuminated control panel, the Heritage Collection has a limited amount of illumination on the control panel switches. The Programs section and the variable speed control knob section do not illuminate. 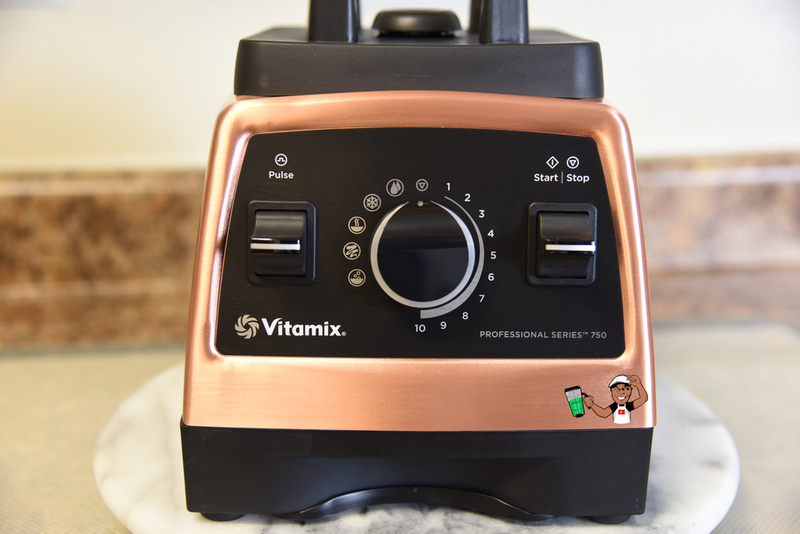 If you already own the original Vitamix Pro 750 there may not be enough feature differences to justify upgrading to the Heritage Collection. The Vitamix 750 Heritage Collection comes packaged with a designated recipe book entitled "Introduction to High-Performance Blending". It's filled with over 100 fantastic recipes with simplified ingredients. An included full recipe book is becoming quite rare even with some of the more expensive high-performance blenders. The Vitamix Professional Series 750 Heritage Collection comes packaged with a 64oz low profile wet container (shown on the left) that fits underneath most cabinets. It's wide in shape which makes it more efficient as a food processor. Also in the box is the tamper accelerator tool. It's the most understated, underrated, underappreciated, misunderstood and most helpful tool that will come with your Vitamix. I assure you, any blender could certainly use one. On the right is the optional 32oz wet container. It's perfect for making drinks and recipes to serve one or two people. It's the ideal companion to the 64oz wet container. Because of the 64oz container being wide in shape and uses a larger blade it requires more ingredients in order to cover the blades fully for more efficient blending. On the left, my own recipe for Butternut Squash Soup with Lentils and Sautéed Apples. It's the perfect comfort soup for any occasion. On the right is my spin on a great recipe for a non-alcoholic Cucumber Melon Mojito. It's very refreshing and a perfect springtime to summer beverage. Both of these recipes are created in my YouTube video review of the Vitamix Pro 750 Heritage Collection here. 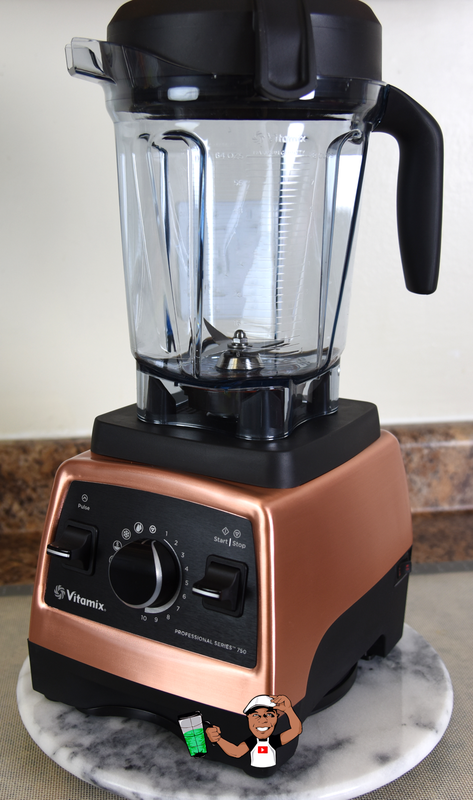 To be frank, all Vitamix machines from the most affordable to the top of the line return the same commercial-quality blending results, so it's really about feature set. As I mentioned, If you currently have an original Pro 750 there may not be enough feature differences to justify upgrading. With the Heritage Collection, Vitamix definitely separated the Professional Series 750 from the other Vitamix machines. The polished metal exteriors, better sound dampening, along with the new Copper Metal Finish make the Heritage Collection a Vitamix worth considering to invest in. Feel free to share your comments below. I would love to hear your thoughts about the new Vitamix 750 Heritage Collection. If you would like to order the 750 Heritage Collection through me click on the red link to order with free U.S ground shipping.